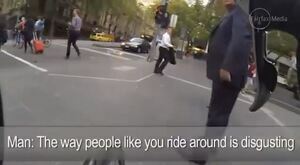 A female cyclist was knocked from her bike on Collins Street in Melbourne yesterday when a man opened the passenger-side door of a taxi. The woman captured the incident, and the follow-up conversation she had with the man who stepped out of the taxi, on camera. Would never happen in Dublin. Posted in Misc and tagged cyclist, Doored, melbourne at 2:45 pm on March 18, 2014 by Broadsheet.